The Lake Forest Park Farmers Market opens on Mother’s Day, May 12 and runs through the October 20, 2019 on Sundays, 10 am to 3 pm. 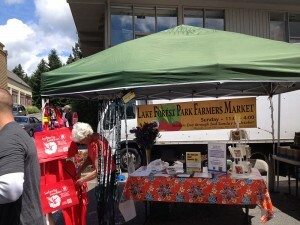 The Lake Forest Park Farmers Market is located in front of the Professional Building at the intersection of Bothell Way and Ballinger Way in Lake Forest Park. There is plenty of free parking. Directions to the Lake Forest Park Farmers Market. The Lake Forest Park Farmers Market is organized and facilitated by staff of Third Place Commons. It is a fresh market with locally grown food, flowers, and plants, although we do host one Crafts Market each summer. For more information for crafters please visit our Information for farmers and crafters page. not allowed to wander into stalls. This is a violation of code as determined by the King County Health Department. 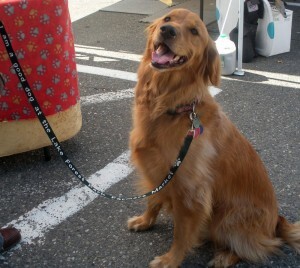 We expect that guardians will come prepared, and will diligently pick up and properly dispose of their dogs’ waste. Please stop by the information tent if you have any questions. Web Design by 3 Crown Creatve.